In its closing days, the Eisenhower administration initiated negotitations on a nuclear test ban with the Soviet Union (this intention was announced by Eisenhower on 22 August 1958). As an important confidence building measure, Eisenhower also announced a one-year voluntary moratorium on nuclear testing (if the Soviets made a reciprocal commitment) would go into effect on 31 October 1958. This ban was later extended to 13 months (31 December 1959), but on 29 December 1959 the U.S. announced an end to the voluntary moratorium although it also promised not the renew testing without advance public notice. This decision not the extend the formal moratorium commitment may have been due to the status of the negotiations, which were faring very poorly. On 3 January 1960, Khrushchev pledged that the Soviet Union would not conduct nuclear testing unless the Western nations resumed it. The US, the UK and France made no move to resume testing, and so the matter rested for nearly three years. On 31 August 1961, Khrushchev announced that the Soviet Union was abruptly abandoning the prevailing de facto nuclear testing moratorium, which they (and the United States) had observed for 34 months. The next day, on 1 September 1961, the Soviet Union began an atmospheric test series of unprecedented magnitude with a 16 Kt atmospheric nuclear shot. Two weeks later, the U.S. responded by initiating Operation Nougat. This series was conducted at the Nevada Test Site, which permitted rapid initiation of tests, but restricted them to low yields (and mostly underground test shots) due to fallout concerns. Although this was still the "era of atmospheric testing", Nougat was actually the first underground test series. Higher yield atmospheric tests followed seven months later with Operation Dominic in the Pacific. The assignment of tests to individual "operations" between this time and the end of atmospheric testing is confused and complicated by several overlapping operations - Nougat, Dominic (or Dominic I), Sunbeam (or Dominic II), Fishbowl, Storax, and Roller Coaster. The available documentation on these operations is somewhat unclear unclear or confusing, and it may be that in some cases a shot may be officially included in more than one operation. Definitely and unambiguously assigning shots to operations for this period is thus hard or impossible. Some disagreement about which shots should be properly included with a particular operation may occur. According to this account Operation Nougat included a total of 44 shots, exceeding the previous record holder, Operation Hardtack II, with 37 tests. Nougat generally resembles Hardtack II in the nature of testing that was conducted. Low yield tactical devices were extensively tested. Thermonuclear primaries and radiation imploson mockups were tested. Much attention was paid to simultaneously achieving desired performance and one-point safety in "sealed pit" fission devices, some designs requiring numerous shots. Since all the tests were fired underground, and only a few of them produced true blast craters (i.e. not subsidence craters caused by blast cavity collapse), there are few pictures available of these tests. The one test for which any relevant images are available is much publicized Gnome shot. This Plowshare shot, conducted by Lawrence Radiation Laboratory (later Lawrence Livermore), was fired in an underground salt dome formation. 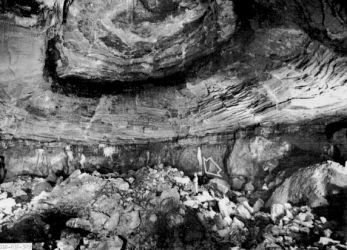 A permanent stable cavity 170 ft. in diameter, and 80 ft. high, was formed. This one of the very few nuclear test cavities (perhaps the only one) to avoid collapse. Some radiation accidentally released as a result of pot shot drilling, and detected off-site. Chena 18:00.00.12 10-Oct-61 NTS, Area 12b Tunnel -838 <20 LRL WD Arrow device, possible W-44 proto., sim. to D-I Swordfish, yield much lower than pred. Feather 16:30.00.13 22-Dec-61 NTS, Area 12b Tunnel -812 0.15 LRL WD "...results quite striking." Packrat 17:00.00.12 6-Jun-62 NTS, Area 3aw Shaft -860 <20 LASL WD Successful (see above for similarities), investigated internal initiator to improve safety, increase yield, reduce weight 10 lb.